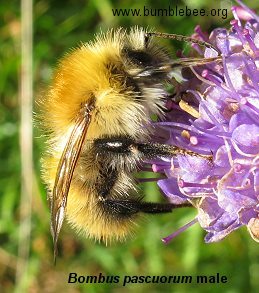 e-book on how to recognise the 6 common bumblebees available now from the downloads page. The workers and males look similar to the queen, but are a little smaller. Lengths, queen 16-18, workers 10-15, male 13-14 mm. This queen above has her tongue sheath extended, her tongue is inside and is longer than the sheath. In a very sunny summer the hairs of older bees can become faded and appear beige in colour. 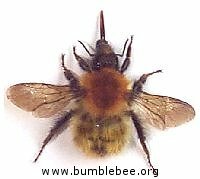 The thorax is always covered in hairs, with other bumblebees there is sometimes a bald patch in the centre of the thorax of older workers and the queen. 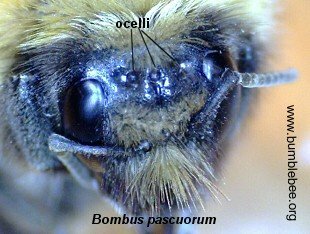 This can be caused by wear as the bees rub against the side and roof of the nest, but this is hardly ever seen in Bombus pascuorum. When I was marking bees in order to follow them and record their foraging behaviour I found that B. pascuorum was the most difficult to mark as its thorax was so hairy. Early in the summer, before it has been bleached by the sun, the hairs are a beautiful, rich ginger colour as you can see in the photograph above. B. pascuorum nests just below ground in old mammal burrows, or on the surface in grass tussocks. Successful nests can have as many as 150 workers. After founding the average nest lasts for about 25 weeks. The cuckoo species is B. campestris. 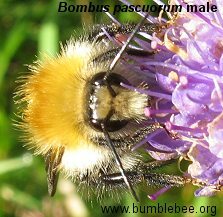 Some say Bombus pascuorum can be aggressive when disturbed, even chasing after people. However when observed during foraging it is no more aggressive than any of the other species. The photograph above was sent in to me by a visitor to the site, and shows typical behaviour of scrabbling around in grass, and pulling bits or dried grass and moss into the nest. I believe that this bee is suffering from the recent habit of farmers cutting their grass for silage in June/July instead of for hay in August. 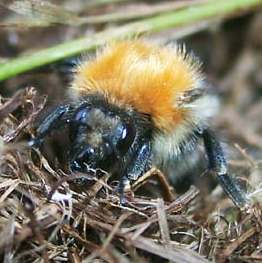 In Scotland the queens have just established their nests - Bombus pascuorum is a rather late-starter at nesting - but have few workers when the nests are destroyed by the tractor. Some queens will be killed sitting on eggs, others will have the onerous task of establishing a nest again. 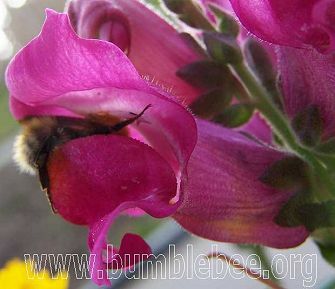 Fortunately it is still a fairly common bee, and is very valuable for pollinating the more "difficult" flowers such as antirrhinum, below, where an inexperienced forager hesitates before plunging into the gullet of the flower allowing the top petal to fully enclose her. Only a heavy and strong insect such as a bumblebee can get into such flowers. Bombus pascuorum has a medium length tongue and can often be found foraging on clovers (see below), vetches, blackberries, and later in the year on thyme sage and lavender. The nectar in these flowers can only be reached by a bumblebee with a medium to long tongue. 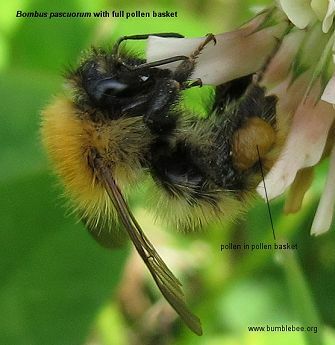 Below is a fairly old worker with a full pollen basket foraging on clover. You can tell she is fairly old by the wear to the edges of her wings. This photograph was taken at the end of July on a path at the edge of woodland with open fields on the other side of an old stone wall. This is typical pascuorum habitat. Below you can clearly see the 3 ocelli (simple eyes), as well as the compound eyes. Above and below is a male foraging on scabious. As you can see he looks pretty much like the workers and queens. The main differences are, the rear legs do not have pollen baskets, and also his head has more ginger hairs below the antennae.